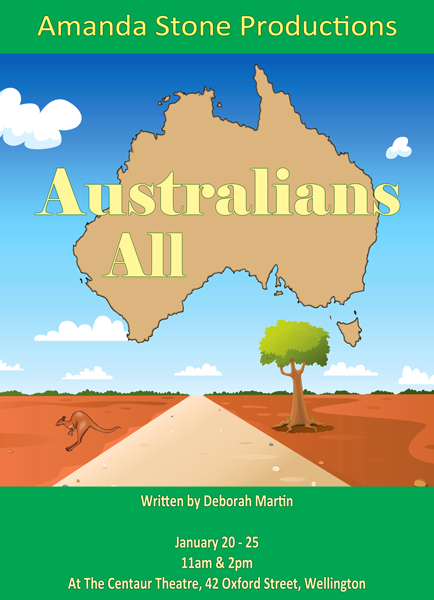 Australians All is a great musical about the exciting history of Australia that the whole school or a single class can be involved in and features 8 marvellous songs. The musical consists of 4 main roles and loads of small parts with chorus groups of miners, convicts, pioneers, settlers and more. Seven historical periods are looked at and each setting involves a mini-scene with a range of characters pertinent to that scene. E.g. the gold rush involves miners, women of the goldfields, troopers and the Eureka protesters. The whole play is linked together by the two modern day children who journey through history and the two narrators who tell the story. There is a song in each setting and a wonderful finale to be sung by the whole cast. The show may be performed with one painted backdrop only. Each different setting can easily be created by items/props brought onstage and set up by the cast and stagehands. The staging of Australians All provides a great opportunity to examine Australian history and a number of cultural aspects including looking at the development of Australia from the original owners to the Federation and looking at events which changed and directed the course of history. John and Emma are on a school excursion at an exhibition looking at the history of Australia where they are learning about two pioneering figures, Henry and Polly. John is complaining about the boring day and how disinterested he is in history while Emma just wants to look at the exhibition but is being distracted by John's complaints. Finally, Henry and Polly, tired of John's insulting remarks, come to life, much to the children's astonishment and offer to take them on a journey through the past to prove to them how exciting history can be. What follows is a parade of people and events through many of the significant periods of Australian history from the original owners to the Federation. The children interact with and often cause trouble for each of the groups that they meet but they still have lots of fun and excitement and learn a great deal along the way. The show can be performed with a smaller cast of 25 - 30 or by a very large cast with large groups involved in the songs and dances. There are basically 7 parts to the story and each part may be performed by a grade or group. Within each of these parts there are small speaking roles for individual children. Each of the groups (Aboriginal puppets, convicts, miners etc.) move off to make way for the next group while action continues with the lead characters upstage. The speaking roles and cameo roles (Caroline Chisholm, Ned Kelly etc.) can be played by children within each group or by a core group of older children who appear in each scene playing these different parts. There are four lead roles: John, Emma, Henry and Polly which are best suited to clear speaking and expressive actors. The other roles belong to one of eight other groups. The stage hands, which help to set up the different scenes while dressed in period uniforms, the Aborigines, the convicts, the pioneers, the gold rush, Cobb and Co, modern times and selection, the 1890's depression and the colonists. The groups have a number of different roles and are adjustable in size depending on the availability of actors.